Can I call this my way-too-soon review? Not really. 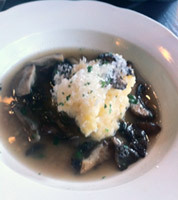 I had lunch this week at the newly opened Mona Restaurant in downtown Minneapolis, and I can’t wait to go back. Chef Lisa Hanson runs the kitchen, and the redesign of what used to be a mediocre-at-best Chinese restaurant is gorgeous. Lots of dark woods, nice bar, open kitchen—it’s beautiful. Lisa told me that since she’s going to spend 16 hours every day in the space, she wanted it to look good. I love the concept for lunch: It’s a one-page menu with about 18 items, and most of the items are $5 or $6. Our server told us that the proteins were all about three ounces, which somewhat confused my friend Colin. “What does that mean?” he asked. “We should order two things!” I said. So he ordered the polenta ($6) and the lamb burger ($7), and I ordered the fregola ($5) and the chicken liver pate sandwich ($6). The sandwich wasn’t a sandwich at all, it was three slices of bread (shown above), topped with a luscious liver pate, which was topped by a perfectly tart rhubarb compote and some Northern Lites blue cheese. Just a glorious blend of spring flavors. I liked the fregola (right) just as much—it was bright and fresh thanks to a healthy dose of preserved lemon on top of the tiny toasted pasta balls and the chunks of feta cheese. I loved the polenta—it was creamy topped with shavings of cheese, surrounded by a moat of a roasted mushroom jus (with chunks of mushroom guarding the polenta castle). Very earthy and rewarding. 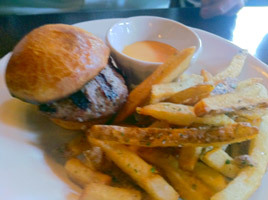 The lamb burger was slider-sized—very nicely seasoned with visible basil and garlic in the burger, a nice pimenton aioli, and some very tasty french fries. Crispy and potato-y, just how I like them. At first I thought the serving was too small, but it was really the perfect size. No need for an 8-ounce hunk of lamb at lunch—we’re all working! We have meetings to attend and we can’t be in a food coma! 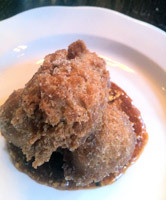 We tried a couple desserts: I didn’t really care for the doughnuts—the caramel sauce tasted slightly burnt to me. The flourless chocolate sundae was a decadent delight—kind of a riff on a brownie sundae with big chunks of flourless chocolate cake in the vanilla ice cream. I’d love to see more creative ice creams to play with the cake, but it was a well spent $5. The service at Mona is very welcoming and friendly. 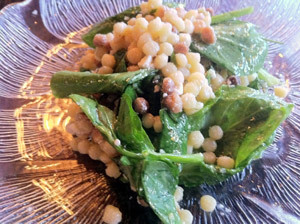 For lunch—as they get busier—it’ll be interesting to see if Mona can execute at the speed diners will need to be served. Good thing to know for dinner: Parking is validated in the underground Accenture Tower parking lot. I know it’s soon, but so far Mona is extremely promising, and a welcome addition to a business district that needs some excitement of the non-food-truck variety. 333 South 7th St., Suite 190, Mpls.